In the world of crafting there is a large variety of types of vinyl that you can use with your various cutting machine projects. Today I want to give you a brief run down of the different types available, and when you might use them. 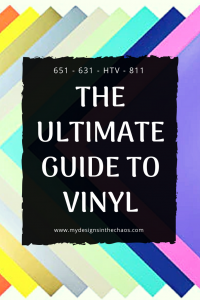 So let’s go over the best types of vinyl to use with your cutting machine projects. This type of vinyl can be removed pretty easily without creating damage to the surface it is being removed from. Think walls, and in home decor. This type of vinyl can be used on basically everything but the walls of your house. It is good for car decals, cups, and things you want to stay in place for quite a while. 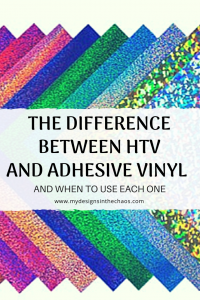 There are a couple other vinyl options (like 751 and 641) for adhesive but today we are going to keep it super simple with the two main options you will probably be using. Heat transfer vinyl sticks to fabric once it has been heated up. My favorite brand to use is Siser Easy Weed but there are tons of options on the market for you to try. 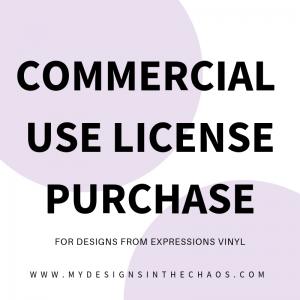 This is the type of vinyl you will want to use when making shirts, hats, bags, etc. Most heat transfer comes on a clear carrier sheet. You will want to reverse you image when cutting HTV otherwise once it is applied it will be backwards. There are several different variations of heat transfer vinyl. Officially this last one isn’t a vinyl but a stencil mask and it is used quite frequently with cutting machine projects. It looks (and feels) a lot like vinyl so I wanted to throw it in here. This stencil vinyl is called Oracal Oramask and comes in 813 and 811. Use this material when you are painting or even etching. It is designed specifically to use as a stencil so it has low tack and tears easily when you are peeling it up after the design has been painted. It usually comes in a large roll because it is only good for a one time use. That was a bunch of info on types of vinyl material. Curious about more of the terminology used with cutting machines? Check out our post here where we decode and explain crafting terms used with your cutting machine. We also have put together an quick reference guide for you, so make sure to pin it for the easy access in the future. Which is your favorite vinyl to work with? Disclosure: We do participate in the Amazon Affiliate Program and at no extra cost to you will earn a small percentage when you shop through our links. All opinions are our own and we do not recommend items that we don’t personally use and love.